The 3DS XL seems to have been a success since its launch, and is certainly the model of choice for various members of the Nintendo Life team. It's come in a variety of designs, though has lacked what was once a much appreciated accessory of the original model — the charging cradle. Though little more than a plastic shell with some connectors, it was a natural habit to leave the cradle plugged in an dock the 3DS when not in use. After what's seemed like an eternity, Nintendo of America is now bringing out a range of coloured charging cradles for the 3DS XL. They're not hitting retail as yet, however, but rather arriving on Club Nintendo on 31st October in limited quantities; they'll set members back 500 coins. As is often the case when anything enticing and potentially rare appears on the service, expect the site to be busy on Halloween. Nothing similar has yet been announced for Europe, but we will provide an update if it is. So, will you be spending your hard-earned coins on one of these? Thanks to WhiteKnuckle for the tip. I'll take one. The only problem I have is deciding which color (besides yellow, that one is hideous). @ThomasBW84 - They are 500 coins each, according to the club nintendo home page. what do you all think will be the best color for the coming Zelda 3dsXL? And I bought a 3DS XL a week ago! Although to be honest I never use the cradle on my normal 3DS. I, uh... My 3DS has the Mugen battery installed, so it won't fit. Dammit... still 100 coins short. I missed my old 3DS cradle after I got my XL. @Razanbuddu I would choose white if I were you. I think it would look pretty legendary. Are we supposed to plug our existing charger's cable into the back of this piece of plastic or does it come w/ its own cable? @takingshape No cables are included. In black it sells for $19.99 plus shipping. So you will need to use your existing charger, something our European friends had to buy seperately. I'll take a blue one please. dangit. I had just spent most of my coins to get the shirt on club Nintendo for my grandpa. I only have 80 coins left. Bad timing as usual. 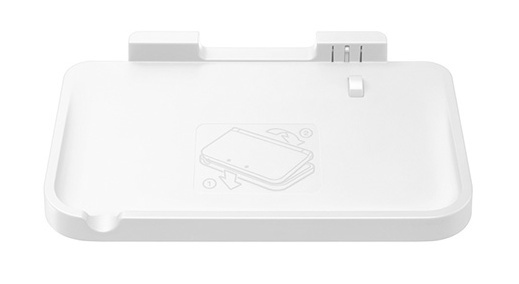 Forgive my ignorance, but how is a cradle setup any better than just leaving the a/c adapter plugged into the wall and hooking the 3DS up to it directly? What's the benefit here? Cool idea, but for 500 coins I'll pass. Definitely not worth that to me. I'd rather spend 10-20$ if I wanted a charging station for my 3DS. I'm honestly surprised the XL's don't come with these in the package to begin with considering Wii U Deluxe bundles come with stands for the gamepad. They look a lot nicer than the standard 3DS ones. The shape matches nicely, even the cheap plastic color, and I like the little cut-out to pick it up. 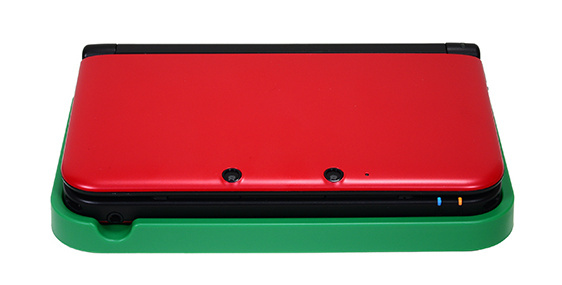 But anybody buying 1 should get a color to match their 3DS, green and yellow are awful. Well maybe the Luigi 3DS XL would match the ugly green one. I'll take a red one! @Morgan19 Basically it's so you can be even lazier about charging your 3DS XL because instead of hooking it up you just place it on the cradle and it charges. Plus it looks kinda nice in my opinion. idk, i think the green actually may look really nice with the zelda 3dsxl. like links tunic. I am unreasonably excited about this. I almost bought the XL cradle from Nintendo's online store a few times, so I'm definitely going to try and jump on this. Ah, fantastic!! Like @Ron_DelVillano I've definitely had the black version in my shopping cart on Nintendo's site a few times before backing down, so I'm going to grab a yellow one to match my Pika XL this time! Hm.. I'm undecided if I want to pick up a red one or not... I usually have my charger nearby and it doesn't take long to plug it in. Also... it seems like this would use a lot of electricity since it would be plugged in 24/7. GAH! NOT FAIR GIVE TO EUROPE! YUUUSSS!!!!!! I'll order mine at midnight! I don't care what color I end up with... I have the Animal Crossing 3ds so any color will go along with it. I just hope I can grab one before they disappear. yellow for my Pika XL omg!! Now white or yellow for my pikachu? White, I want white! But... I'm not sure if I want to use up my hard earned coins for this, even though it is very nice. Don't want it. Just gonna get the black one. I'm getting blue for my blue XL. It will keep my 3DS charged when I'm not using it and gives it an assigned location in my room while concealing one more wire laying around. Too bad I never use the cradle. Never even took it out of the box. Wish they'd just bring back the Luigi Basket and Luigi DS Case, since it's still "Year of Luigi" and all. I hope we get this in the uk(and eu) i have 2200 stars on my club Nintendo account don't know if that would be enough but i hope it is. Stop confusing me, when I first saw the article I saw the word coloured and thought oh great another thing that's only for EU, then I clicked on the article and saw it was colored charging XL cradles for NA Club Nintendo. Blues my favorite color so I will pick Blue. I'd probably go with a white one to match my white 3DS XL. Then, if I end up getting the LBW 3DS XL I'd just wait until I could get a normal black one. Of course, this plan would only work if these awesome Charging Cradles make it to the Downunderverse. I don't think it'd use all that much despite being plugged in all the time. The battery light on my 3DS turns off after a while when its done charging so if I had to guess it probably only uses just enough to keep the battery from losing its charge. Hell yeah. I'll be all over this. getting the Blue one FTW. Hopefully I can get a blue one before they run out. Finally they give us something we want! I'm getting the blue one. To think before these were $20 and only available through Nintendo directly. Hats off to you, Nintendo! I never used the original cradle, but maybe someday I'll have a use for this. I'll try to get a red one if they don't sell out in 2 minutes. I will try and get one but if I dont I wont be too upset. @rjejr Yellow or white for Pikachu 3DS XL! I have the pikachu model So I'll get yellow and another color. I want all 4 but don't have a spare 2.5k coins, plus need to do a few surveys to get enough coins for the 2nd one I'm 100 shy atm. Wish they were for original 3DS. My one's broken. Hmmmm which one of these best matches the ALBW 3DS XL?? 500 coins? No sweat. This'll be super useful, I'm sure. I feel I've misunderstood the purpose of these things. 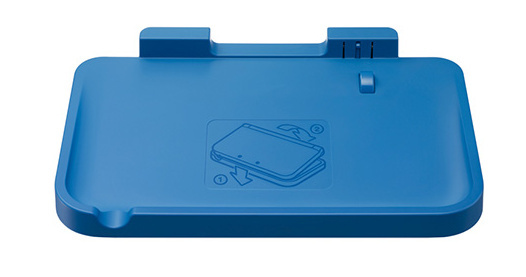 I thought you could charge the cradle itself and then use its reserve power to charge the system, but judging from what everyone's saying it'd need to be plugged in to charge the system, making it exactly the same as charging the 3DS directly, except with an extra piece of plastic in the way. Yeah, I mean... what IS the point of these? wow i hope they come to nintendo eu ... me want's a white one togo with my white xl. Wow, these look a lot better than the standard black one. wow this is amazing news. I thought it was ridiculous at first but then once I traded for an xl I missed it like crazy, it really was nice to have. Looks at the image Ooh, Legos! FINALLY A CHARGING CRADLE YESSSSSS! I don't know if I would actually use it for its intended purpose, but I'd sure like to get one to collect. I already paid for a black one that I never use, but on the other hand, there's nothing else to spend my Club Nintendo coins on. Might as well get a nice red cradle to match my red 3DS XL. a blue and a red ones for both my Pokemon X and Y systems, and finally a white one for my daughter pink 3dsXL. I'm still like 1,000 coins short so its time to buy some Wii U games (I don't have a Wii U but I'm waiting for the Mario bundle to arrive), as well as unwrap a few games that I haven't played yet (Pokemon X, Pokemon Y and Mario Party 9!!). 500 coins is a ton for just a useless piece of plastic. What function does it serve? None really. I have a blue 3ds cl, should I get red or blue? THAT'S WHAT I'M HOPING!!! I got an email back from the Nintendo customer service rep yesterday and even they had no clue when the cradle goes live. If it doesn't go live at midnight then I have a feeling it will go live at 9am since that is when the e-shop stores are updated with new games on the Wii U / 3DS for me. @BowserTheGreat That would be a crime. Anybody know what time they are coming out? Annnnnd great. The server can't handle it. "Due to high traffic volumes, the sign in function may not be working properly. If you are sure your username and password are correct, please keep trying." They're available now! My green cradle has been ordered! Bought three: the yellow for my Pikachu 3ds xl, a red one for the Pokemon Red Console and a green one for when the new Luigi's 3dsxl appears. I'm hoping that the white one sells less than the others and can be acquired after I purchase my WiiU. Also, my blue 3ds XL (Pokemon one and regular one) and the upcoming Zelda won't mind a generic black charger from Nintendo. Couldn't get a blue one so I had to settle for red. i checked and checked and checked and it never updated for me to get one, then when it finally does its all sold out? what kinda of BS is that?! I hope that the selfish people who bought ones they dont need feel proud of themselves. I hope you make lots of money off them. Well it looks like I will be getting 4 red cradles. When I ordered the cradles a Wario error kept coming up so I just tried until it worked. My orders say that 4 cradles are being processed. Too bad I didn't get the blue one. Only two of them have coins used next to them though. I have a feeling these "extra cradles" will be fixed as they have zero coins used next to them. Seriously, did they have like 2 of each colour or something? I checked these some 9-10 hours ago and they weren't even available, now they're gone. Wonderful. Yup, just like I thought! They cancelled all those extra charging cradles that were paid for with zero coins. So maybe the sales count is wrong and there are extra cradles, and maybe once the first wave of orders are sorted out then they might but them back up for redemption again? I was checking all day yesterday for when they were going to be put up, then all of the sudden they were sold out? WTH? I hope they get more of them soon. the hunt continues to contact them, I shall! guess what I just got in the mail..my club nintendo 3ds xl charging cradle. the white one. I'm happy. off to bed now.